NVIDIA teased an upcoming 7.7" tablet from Toshiba at MWC 2012. 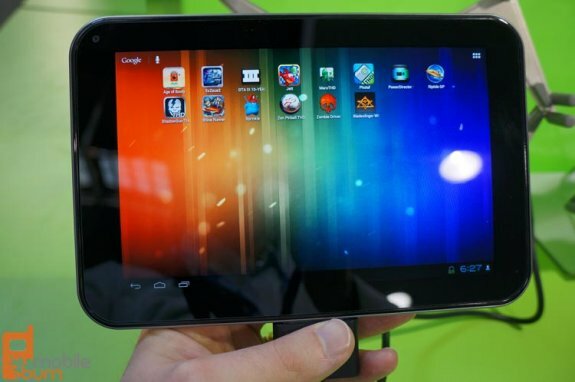 The Android 4.0 tablet has a 1280 x 800 pixel resolution and features the NVIDIA Tegra 3 SoC. Several pictures can be viewed over here. In fact, it was in NVIDIA's booth where we spotted the thin tablet, as the chipmaker was using it to show off the gaming capabilities of the Tegra 3 chip. The nameless 7.7-inch Toshiba tablet (Excite X7, perhaps?) has a 1280 x 800 pixel, 7.7-inch AMOLED display that is extremely bright and vibrant with great viewing angles. The tablet itself is very thin, much in the way the X10 is, and it has a flat back like the X10. The rear has a textured finish that helps you grip the tablet when you are gaming hard. We did spot micro-USB and microSD ports along the side of the tablet, and there are both front and rear cameras, though we are unsure of the resolution of each.